GIGA GRANADA HILLS: Raid at Golden State Collective? Raid at Golden State Collective? 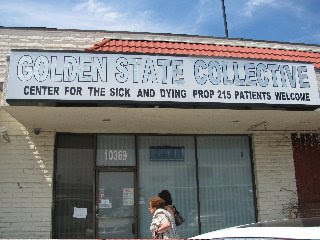 According to a losangelescannabisclubs.com user review dated July 3, 2009, Golden State Collective was raided by police. "Unfortunately I am writing this review post-raid that took place earlier this evening. I would be asleep right about now but was not able to get the medicine needed for my insomnia. (The only thing that ever helped me fall asleep at a decent hour.) "
Golden State Collective is the place that I bought marijuana-laced Rice Krispie treats for my stepfather, who had cancer of the liver. The treats were nicely packaged and labeled, which decreased his reluctance to give them a try. They gave him some periods of relief from the months and months of continuous nausea he suffered toward the end of his life, which happened just eight months ago. I have not been able to verify the rumors that GSC was raided; GSC's phone has a "mailbox is full" message, and LAPD has not yet responded to a request for information. 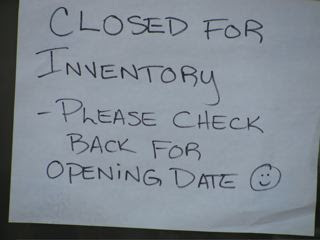 A sign in the window says that they are merely "Closed for Inventory." There's even a little happy face. In February of this year, Attorney General Eric Holder said that the federal government would end raids on legally established medical marijuana dispensaries, but the City of Los Angeles has recently been conducting a crackdown on dispensaries operating without proper permits. What "proper permits" consist of is a matter of confusion for some dispensary owners, it seems, because the city has yet to establish a full set of regulations governing dispensaries. An article printed yesterday in the Wall Street Journal explains that in 2003, proposition 215 established legal protections for medical-marijuana users who had a doctor's prescription; that same year, the city attorney's office issued a moratorium intended to block new establishments until the City Council created regulations. But if dispensary owners filed paperwork claiming a "hardship exemption" -- which can be anything from targeting by the DEA or simply not knowing that permits were needed -- they could still open a new dispensary. Until the recent crackdown, hardship exemption applications went unchallenged by city officials, who seem to have just recently noticed that dispensaries are springing up everywhere. GSC IS DONE. MY HOMIE WORKED THERE AND THE OWNER REALLY F**KED HIM OVER.